How Long Does the Nitric Oxide Booster Last? Increasing nitric oxide in the body allows the blood vessels to expand, according to a report from the University of Southern California. This allows your body to exert more energy to your muscles. Nitric oxide supplements are popular among bodybuilders and athletes as a pre-workout supplement because of their ability to provide energy and increase blood flow. While all nitric oxide booster supplements are different, most offer a nitric oxide boost that lasts between an hour and 90 minutes for maximum effectiveness. After 90 minutes, the effects begin to wear off, even though the nitric oxide booster could last in your system for longer. Because nitric oxide is a natural element in the body, the boost in nitric oxide will usually last as long as the supplement is in the bloodstream and continue to wane as the supplement is metabolized. Nitric oxide is beneficial for workouts because it causes blood vessels to dilate, or expand, which helps pump extra blood to muscles during exercise. This not only helps a person get more pumps, or repetitions, during their lifts but it also allows nutrients to flow into the muscles. This allows a person to not only lift more during their workouts but also encourages faster recovery times for the muscles after the workout. 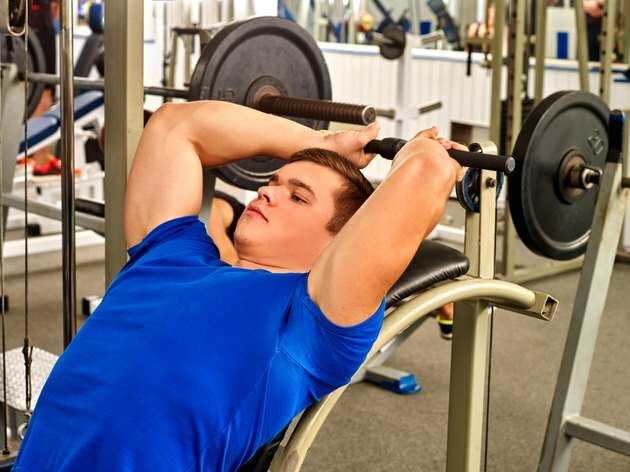 It is recommended that you take nitric oxide around 30 to 60 minutes before intense workouts in order for the supplement to get into the bloodstream, according to MuscleandBodyMag.com. Once the supplement is in the bloodstream, the blood vessels are able to handle more exertion created by explosive lifts and allow you to train for a longer period with a heavier amount of weight. In addition to helping with muscle building and recovery, nitric oxide has been shown to assist in circulation and heart disease, presumably because of the dilation that occurs in the blood vessels. While nitric oxide has been shown to enlarge the blood vessels, which helps with circulation, it is still inconclusive as to whether nitric oxide helps people with cardiovascular diseases, and how too much or too little affects the heart, according to the December 2002 issue of "Heart." While nitric oxide hasn’t been proven to treat heart problems, the fact that the supplement helps increase exercise stamina could lead to people using the supplement as a way to prevent heart problems and cardiovascular diseases. LA Times.com: What Can Nitric Oxide Do For Me? Heart: Nitric Oxide and Myocardial Function in Heart Failure: Friend or Foe?